I promised I'd find bluebells. In London you asked? Yes. This magnificent display is at Kew Gardens. The official date to see them is the first weekend in May. Bank holiday weekend. I am of the view that nature is a bit ahead of schedule this year. So if you are a Londoner might be a good idea to go out there this coming weekend. Fresheyes has not seen bluebells like this before so she was pretty impressed. I have just noticed those bluebells appearing in London, there are beautiful but this field of bluebells is amazing!! Loved your picture ! It's almost a carbon copy of one I took a couple of years back - but unfortunately it was raining back then, really stair-rods ! The smell was divine though ! The colour combination here is wonderful. And I gather they have a strong perfume too. What like? It's really a beautiful picture. Nature is very wonderful in London. Oh that color!!!!! The smell I can't recall, sort of sweet but earthy, not a perfume? Someone bottle it please! A very beautiful field in a very good photo. wow wonderful picture and colors! It's interesting that there have been so many different versions of blue flowers that form carpets of color throughout CDP the last few weeks. There have been blue bonnets in Texas, lupines in California, vincas and scillas in New England and now bluebells in London. It's interesting that they all come out at the same time all over the world. Beautiful! I wish I could visit in person. Unfortunately I can't just beam myself over there from here in the States. Love this pic! The colors are great! What a beautiful shot! All that color -- it's the essence of Spring! And the Kew Gardens have to be a small slice of Heaven this time of year. WOWZA!!!!! Makes me want to kick off my shoes, step through the picture and run through 'em barefoot! WOW!!! Stunning beauty...Then blue is my favourite colour. Oh blimey! That is a fantastic photo. Lucky you were on the ball and got there ahead of time. They're sooooooo beautiful! There have been some around Montreal for weeks now, oddly enough! Ah, Kew Gardens...A dream for a gardener. Each time I come to London, I try to go there. In May, it's wonderful! beautiful pictures. Just had a run through Regents Park, the flower beds look fantastic especially in the morning when the sun rises. Regents Park is my favourite, think its the most beautiful park in London. green walls and blue carpet. You can't ask for a better visual. I'm pretty impressed, too. Not only because I thought bluebells were a Texas thing(state flower and all), but also because you take very good pictures. I'm gonna bookmark you and come back for more. It's a different flower. The Texas bluebell is a lisanthus. The English bluebell is a hyacinth. They are a protected species and so it's a criminal offence to remove the wildflowers or bulbs. You usually find them growing in woodland. It's a lovely sight to see. Beautiful. 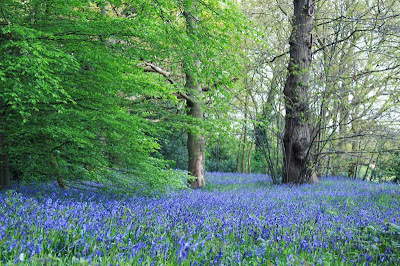 I adore bluebell woods. There's a fantastic one at Badbury Clump in Oxfordshire but I haven't found anything similar since moving to the Isle of Wight. The colours in your image are so beautiful, it looks magical. Bluebell carpets are stunning! Gordon Square in Fitzrovia/Bloomsbury has far fewer but no less beautiful; lovely to find in the middle of the city. I was there the day before the London marathon. My camera had a break down in London so I have your wonderful photo on my blog I hope it is okay?